In this paper I attempt to bridge a gap between territorial planning and migration policy, the domains that usually are considered as isolated. 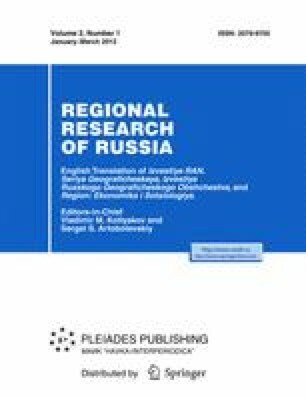 Because of tremendous economic and geographic differences among Russian regions I am skeptical about idea of a priori positive balance between the advantages and disadvantages of international labor migration for any region and industry. The thorough analysis of such advantages and disadvantages for region should be the basis for any regional strategy. Bipolar matrix to systemize the results of such analysis is proposed. This matrix contains both active and passive components of migration strategy taking into account region’s specificity. Original Russian Text © M.A. Klupt, 2008, published in Izvestiya Russkogo Geograficheskogo Obshchestva, 2008, Vol. 140, No. 5, pp. 53–60. The article is upgraded taking into account statistical and other data for 2010–2011.